There are essentially 2 ways of modelling in wax: in simple terms, you can either start with a large block of wax and carve it down. The other method, which is the one I use, is to start with a small piece of wax and build the shape up by continually melting drops of wax onto the piece and scraping and shaping it. It is a long and concentrated process… my stag beetle took a full week to model! The model then gets sent to the casting house (I use AA Fine Castings) who then add sprues and make a rubber mould. The mould allows you to make unlimited copies of the original wax – and therefore cast multiple copies of the original piece. They then take these waxes and solder them on to a big tree formation – ready for the casting process. The next stage in the process is to surround the wax models by an investment which is hardened and then heated to allow the wax to completely melt away. This then leaves a void in the hardened investment – into which molden metal (silver in my case) is poured. This metal then takes the exact form of the original wax model. Evidently, the process is very much more complicated than this but it should at least give you an inkling of the complexity behind a simple pendant. For my part, receiving the freshly cast piece is when the work really begins – with cutting, filing, soldering, pickling and hours of polishing ahead. 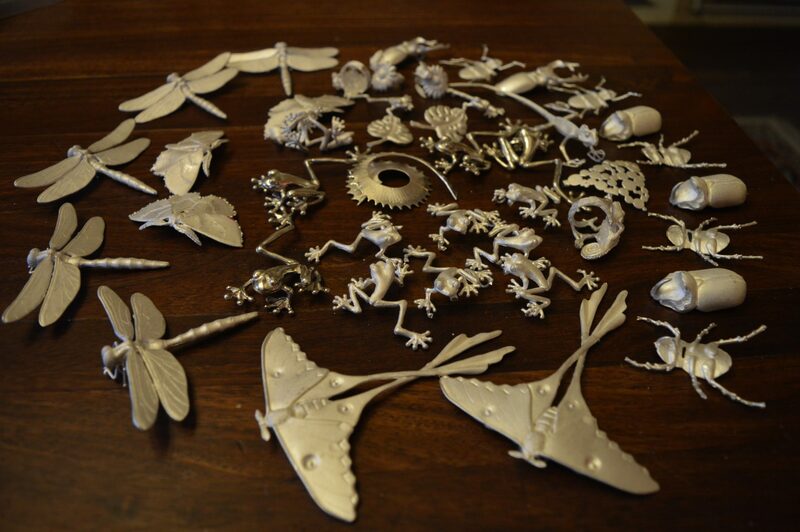 Even the smallest of pieces take upwards of 2 hours to finish, the larger ones many more. This image shows just a portion of the pieces being prepared for the Spring Craft & Design Fair at RHS Wisley next week. I am now really eager for the fair to start – partly because it will be a few days break from polishing!